It's the third week in our Month of Harvest campaign, and we've got a great story to share about a creative outreach that Firefall has been funding since day one. Three and a half years ago, we partnered with Pastor David and House of Glory Church in a creative vision to lift their city through the establishment of a reading room. We rented a small room, bought books, tables, chairs and some tea making equipment. We held a party to launch this gift to the community. Pastor David selected a key woman, full of the love of Jesus, gracious and a woman of books, to be the hostess of the room. To our great joy, this "God idea" has developed in most amazing ways. Here's how it works, The Burmese people love to read and drink tea together, talking about what they are reading. The people are avid readers. Sadly, Pastor David's city has no lending library facility as we would know. We outgrew the small room quite early on and rented a much larger place, with room for many more books and an outside seating area for community discussions about good literature, hosted by Pastor David on Saturday afternoons. During these sessions, he takes off his pastor "hat" and puts on his "reading man" hat, facilitating lively discussions with Buddhist military officers, monks, medical doctor, politicians and anyone else who wishes to pay the one dollar membership to join the Reading Room. We now have nearly 900 members. Sometimes the topic is a Burmese novel, sometimes it is world religions. At this time, Pastor David is well equipped to answer their questions about the person of Jesus Christ. If someone wants to know more about this Jesus, Pastor David or church members will meet them at their home or at a public tea shop to share further. We keep the Reading Room a neutral zone, there to lift the community and serve the many members from all walks of life. This concept has worked well. The room has been the site of storytelling and speech competitions for school children. A national news team brought their cameras and interviewed Pastor David and the hostess. Goodwill is growing between community leaders and Pastor David, thanks to this unique outreach. Some are contacting him to ask more about this Jesus. Recently, a man of influence met with David in a tea shop to learn more about Jesus. After three months of talking, he shared his desire to follow Jesus all the days of his life. Then he asked about water baptism. He destroyed the many idols his family had worshipped for decades. Recently, David had the joy of baptizing this man and his son. They are now members of House of Glory…all because of the reading room. How can you help the reading room? Are you a book lover or fellow reader who would like to see this outreach continue to flourish? Help us keep the Reading Room and other projects growing by donating to our October goal of raising $50,000. We're 29% there, but we need your help to continue the work you have helped us start in nations like Myanmar. Use the button below to give and find specific prayer points below. Read the first and second Month of Harvest blogs! Imagine you’re a child and your parents have uprooted your family to a new city, so they can find work and pay for food and school. Or imagine something happened to your parents and you have nowhere to go. I don’t know about you, but it’s very difficult for me to picture myself in one of these positions, and I really wish I could do something to help the children and families who find themselves there. 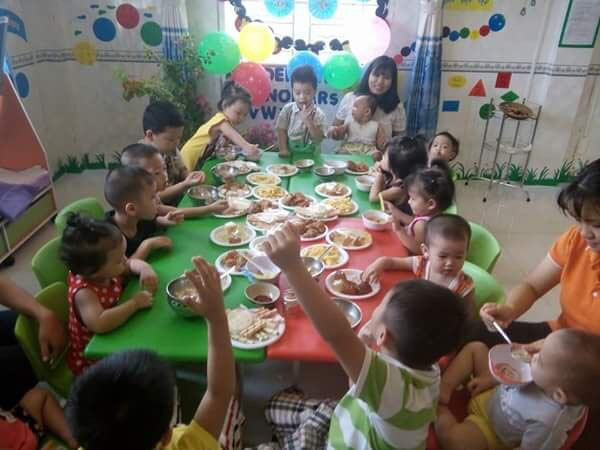 Although this is currently happening in countries across the world, Firefall associate Minh and his wife, Blessing, are doing something to help through the House of Hope ministry in Vietnam. Not only have they taken in several orphans for nearly two decades, they have also been teaching English classes and feeding and educating children while their parents are at work for the past few years. They have a singular passion for reaching children in their community and have already noticed a difference in the environment of their part of the city with fewer children on the streets or susceptible to violence. For the daycare side of the House of Hope ministry, about 20 kids enjoy teaching, group activities and three meals a day. 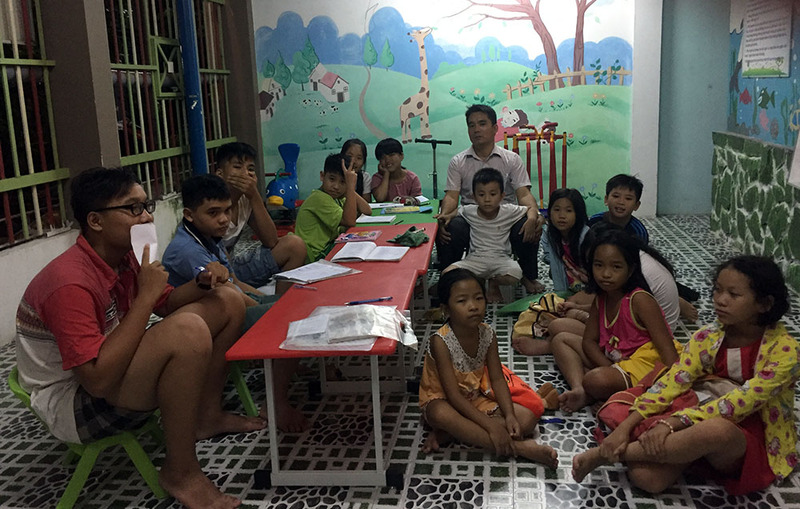 Then, on Monday, Wednesday and Friday evenings from 5-8, Minh hosts English classes for about 30 different children of varying ages, using the Bible to help them improve their writing, listening, reading and speaking skills to help them get a leg up in life. We are thrilled to partner with Minh and Blessing in their pursuit to educate, house, feed and empower these children who could have so easily been forgotten. In fact, this summer three volunteers from Pine Bluff, Arkansas visited the House of Hope to help out for a few weeks. Minh invites any Firefall friends interested in serving to come volunteer with the children. Contact us in interested. Are you also passionate about helping children learn, grow and learn more about the gospel? If so, use the button below to give to our Month of Harvest campaign and goal of $50,000 for ministries like this one. With your help, we will be able to continue to support the House of Hope and make an impact in dozens of children’s lives, while allowing Minh and his wife to fulfill their unique calling in their community. During October, we’ll take a look at some of the ways Jesus is using your financial investment in Firefall International to transform lives, and even whole communities through our Month of Harvest campaign. Your generous giving helped people in desperate need suffering from floods, fires, natural disasters and violent persecution. You also brought clean water to two villages. It’s hard for me to imagine spending hours each day carrying water from a distant stream for my family. All the while knowing that after all the strain and struggle the water would be dirty and infected. What would it mean if all of a sudden I had access to abundant, clean water because someone half a world away cared about my problems? Well, you cared in Jesus’ name and provided clean water wells. In two villages in Myanmar (Burma) the Christians are no longer seen as a threat to the community but as a great blessing. These church plants are now seen in a positive light. Instead of threats of violence, these followers of Jesus hear expressions of thanks. The kingdom of God is coming to these villages through acts of compassion, provision of clean water and hearts that are now open to the life-giving gospel of Jesus. This month, would you consider a generous gift for the ongoing ministry of Firefall International? God is using you to change lives for His glory! Give below and notate “Month of Harvest” on PayPal to help us reach our $50,000 goal during this Month of Harvest. Pray for the house churches in these 2 villages that they can bring others to Jesus. Pray for hearts of the villagers. Pray that their gratitude for water brings openness to the gospel. Pray for new believers to become strong disciples who disciple others. Check back in next week for another story of exciting Firefall projects. Families who have experienced persecution in Myanmar who Firefall supports. My "history" with the persecuted church goes back about 10 years ago, to my first internship at Voice of the Martyrs in Bartlesville, Oklahoma. If you've ever been to Bartlesville, then you know that there is not too much there other than a few oil museums, a cute little downtown (where the office was located) and a Frank Lloyd Wright building. They also had some of the most beautiful sunsets I've ever experienced, since the land is so flat compared to my home state of Arkansas and now home of North Carolina. I spent that summer not doing quite as much writing or editing as I had hoped, but I got to do plenty of learning. I learned about how the persecuted church spans countries and languages and cultures. I learned countless stories of Christians who had been beaten or even killed and yet did not give up their faith in Jesus. Most of all, I learned to look up to this strong and brave community of believers. And I'm glad that today, along with Firefall, I'm able to have a part in supporting persecuted Christians (especially in Myanmar). This can range from sharing stories of persecution and ways to help to all of you through an email or having specific people to pray for myself. That's why I'm so excited that I get to attend Firefall's upcoming Eyewitness Accounts of the Persecuted Church on October 14. It is a special event taking place at the Garland County Library in Hot Springs, Arkansas that will be featuring stories from the persecuted church in Myanmar from our very own Firefall associates Pastor David and his wife, Dimte. I would encourage anyone who can to register to attend this free event and be able to join the conversation about this important topic. Who knows what type of inspiration, prayer points or stories you will leave with? Arkansas summers are not my cup of tea, or should I say not my tall, frosty glass of iced tea! Being freckled and fair, these 115-degree heat index days leave me drained and surly if I am honest. I long for the delightful breezes of April and October and the comfort of my old jogging suit. For me, summer in Arkansas is to be endured, at least the months of July and August. This summer, however, has been one of "suddenlys" and surprises. In May, our associate in Vietnam wrote to ask if he could spend a few days with us in early June as he was between Seattle and Pittsburgh on business. We enjoyed hosting him for a few days of fellowship and relationship building. During a conversation with a pastor and longtime friend of Firefall International, I shared the concept of sending college age volunteers to Vietnam to work in a children's center serving orphans and underprivileged children. Some preschoolers are guarded in their meager homes by siblings aged 8 or 9 while both parents work to put food on the table. This pastor immediately said, "I have two guys who need this opportunity. Can we set something up for July?" A day or two later, I found myself in the Little Rock airport introducing our associate from Vietnam to the two young men who would soon be spending a month serving in a culture a world away. Here we are in late July and the guys have been there two weeks already. The trip has been beneficial to both the college guys and the kids. The guys are gaining the priceless gift of a larger worldview enhanced by the compassion that cross cultural service gives if we come to it as learners, not experts. The children have grown in their English language acquisition, an amazing "lift" for disadvantaged children there. New friendships have been forged, treasured memories formed and a newfound appreciation of the many advantages in their lives. They toured a hospital a few days ago where 2-4 people share one small bed due to overcrowding. I have had the joy of hearing from the guys via Messenger every day or two about their strange and wonderful summer. At first, I had to face some jealousy that I was the "sender" and not the "goer" this time. As I embraced my assignment of coach and cheerleader, my days have been full of prayers for them and the children, plus laughter as they are stretched by new foods and customs. They are not fans of soup for breakfast. What a joy to be a tiny part of something God has sovereignly orchestrated to touch all these lives. Hopefully, I will remember the summer of 2017 as the first time we launched volunteers to SE Asia and not another dreaded Arkansas scorcher. Their joy has become mine and that is sweeter than a giant gulp of southern sweet tea! Our Firefall International associate in Vietnam was visiting us last month. We were sharing lunch in a restaurant on a rainy Saturday when he related a painful memory. Even though both of his parents were still living, he had been abandoned by his family. He remembered standing in the rain as a 7-year-old. With night falling he had no place to go to get out of the rain. He asked himself, “Where can I go tonight? Where can I stay?” Underneath those questions was a deeper one. “Why doesn’t my mother love me enough to take care of me?” He shed tears at our meal as the pain of that moment returned. Over 30 years later, no one would know the heartache of abandonment he lived through. He is a loving husband and father of two. He has built a home for orphans (he was caring for 9 street children when he and his wife were married!) He is reaching out to his neighbors with the gospel through English lessons, which Firefall International is helping to sponsor there. He’s also helping to send the gospel to an unreached people group in the remote mountains of Vietnam. The early church was faced with adversity and persecution. That caused the believers to scatter like seeds in the wind throughout Asia Minor, taking the gospel with them and planting vibrant churches as they went (Acts 8:1-4, 11:19-21). For the early church, and for our associate, adversity was turned into opportunity. He became a bridge to life for the orphans and street children of Vietnam. What adversity are you facing today? How can God work through it to make you a bridge to life? You might remember in our newsletter last month that we wrote about House of Glory planting a house church in a village of Nepalis in Myanmar. There are about 400 people in the village, and they need a well so they can have safe drinking water. It gives us great joy to share with you that the well is now being dug for the village just outside of Pastor David's city. Very soon, a community of 300-400 people will have access to clean water all year-round. The well will hold about 2,500 liters (about 660 gallons) of water and should be completed in about two weeks. We are sharing photos of the dedication of the well site, which was last week. There is a small house church nearby. The water will be shared as a blessing from the love of God and your love, too, as a friend of Firefall. Let us pray for success in the drilling process, for a free flow of pure water and for news of the One who gives "living water" made known to thirsty souls in this area. The combination of good works accompanied by a living witness has proved very fruitful in this nation. May this water open the hearts of many to hear of the love of God for them. I've been home from Myanmar for a few weeks. Yes, it's wonderful to return to my husband, my creature comforts and my two labs. Of course, there's no place like home. Each day I return to memories of the acts of service I received while there. To witness and partake of joyful serving is to be touched, softened and changed. I am enriched by spending time among a community of Jesus followers who have learned how to serve. Pastor David's mother remembered my favorite Burmese snacks and welcomed me with them at the football stadium. Sister May insisted I wear one of her coats during a chilly night of Firefall Football Challenge activities in her courtyard. Jonah, our driver, arrived at our hotel on time and with a wide smile on his face, even when we had tire trouble on the road. At May's farm, food for 200 was prepared, aluminum plates were filled, delivered and later washed in a symphony of serving. The laughter in the kitchen among the cooks and servers made the rest of us jealous to be with them. They understood the secret of serving and their joy was contagious. A few weeks ago, Nancy and the team returned from their trip to Myanmar for the Firefall Challenge Cup #3! It was a fantastic trip with new relationships formed, personal growth and lots of fun football (soccer) playing. We want you to hear directly from the Spanish soccer players about how the trip impacted them. Make sure you're signed up for our email newsletter to get the full trip report next week! To serve in such a different reality has made me think about my service and commitment in my daily life. It is an honor for us to help you and the Firefall ministry. All my trips to Myanmar change parts of my life. It was really a blessing to me to bring a Spanish group with me. This makes me feel really happy, and is worth all the time invested in this project. It's been a challenge for me, and I think that it was the first trip of thousands. It’s changed the way I see things, and it gave me another point of view to understand God and the different ways of sharing his word. On my last trip to Yangon, Myanmar, Nancy and I took our U.S. ministry team through both a Hindu temple and a Buddhist holy site with hundreds of temples. In both places people were repeating prayers and making offerings, hoping that they could merit a better reward in the next life. It’s always hard for me to see these acts of empty worship. Sincere, certainly, yet empty. People who follow the teachings of Buddhism or Hinduism live in a vain hope that somehow they can merit divine favor. We who hope in Christ have already entered into the blessing of our loving Father through the offering of a perfect life, given for us, once for all (Hebrews 7:27).